Shadow art is a fascinating form of sculpture where a seemingly disordered pile of items is actually carefully constructed to produce a specific shadow when lit correctly. But one of the constraints of shadow art has always been that the display required lighting from a precise angle to produce one image. Now Niloy J. Mitra of the Indian Institute of Technology Delhi and Mark Pauly of the Swiss Federal Institute of Technology Zurich have created an entirely new way to look at shadow art. 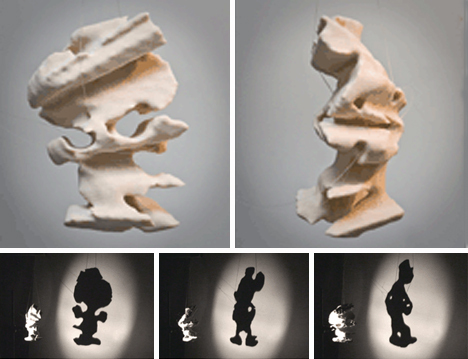 Their computational tools let a user create a 3D model that, when lit, will produce up to three different 2D shadows at once. Their Shadow Art tool takes a user’s supplied set of binary images and optimizes them for the rendering of shadows. 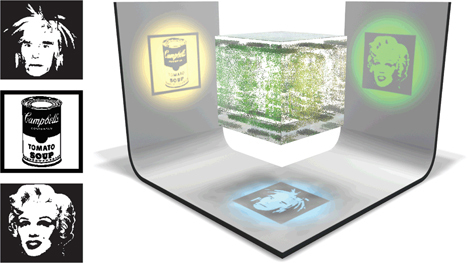 The software tweaks aspects of the “shadow hull” to produce a 3D shape that can project the chosen images from their respective angles. Once the shape has been optimized and rendered, it’s even possible to print it via a 3D printer, creating a physical sculpture that will produce up to three distinct, recognizable shadows. The best way to understand the project is to watch the video below; it gives an outstanding overview of how the shapes are created. Mitra and Pauly entered their video in the 2009 SIGGRAPH Computer Animation Festival, and it was one of three finalists for the Best in Show Award. According to comments on the team’s YouTube account, they are planning to patent the software and release a demo version for academic use.